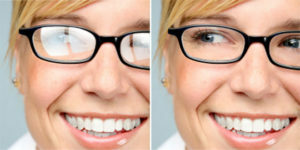 Plastic lenses can be soft and easily scratched. Applying a hard coating is a simple and effective way to increase lens hardness. This coating is a thin, multi-layered film applied to the lens. These layers help to improve the strength of the lens, improving durability, with resistance to both physical and environmental damage. This is an advanced multi coat which makes the lens water & oil repellent. Anti-reflective coating improves vision, reduces eye strain and makes your spectacle lenses look more attractive. These benefits are due to the ability of AR coating to virtually eliminate reflections from the front and back surfaces of your eyeglass lenses. With reflections gone, more light passes through your lenses to optimise visual acuity with fewer distractions, especially at night. These lenses look nearly invisible, which enhances your appearance by drawing more attention to your eyes and helping you make better "eye contact" with others. Most premium AR lenses include a surface treatment that seals the anti-reflective layers and makes the lenses easier to clean. "Hydrophobic" surface treatments repel water, preventing the formation of water spots. Do you suffer from eyestrain, eye fatigue or even headaches with prolonged use of digital devices? Extensive studies have linked these symptoms to blue light, which is emitted from the screens of digital devices and artificial or fluorescent lighting. Blue light has wavelengths of between 400 and 500 nanometres and is part of the visible spectrum. When visible light enters the eye the blue light is focused in front of the retina. This causes the eye to constantly try and maintain its focus which adds significant pressure to the eyes’ energy expenditure. If blue light is reduced, it can greatly alleviate eyestrain, without compromising visual acuity. Blue cut lenses are a revolutionary solution, with the blue-filtering properties in the lens itself. Mirrored lenses are excellent for situations that require a reduction in the overall brilliance of light, such as sunlight reflected off water or white beach sand. They reflect light away from the eye (beyond the standard absorption of a tinted lens) which is ideal for people who are light-sensitive. Applied to the surface of the lens only, it gives the lens a shiny mirror-like appearance that reflects rays from surfaces such as water, white sand and snow. 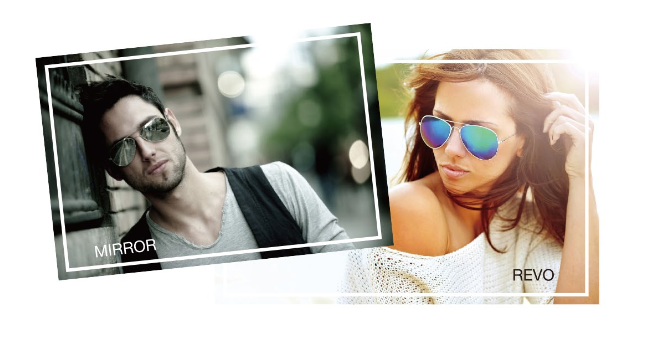 They are typically applied in combination with an underlying sunglass tint.